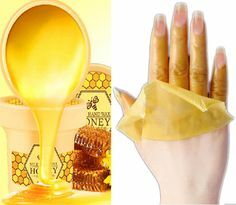 Premium Milk and Honey Wax Mask can nourish, moisturize and tender Your hands and feet. Gentle, relieve, nourish, improve dry skin. Nourishing by natural honey, it supplies water to improve rough skin and creates baby soft tender skin for You. Suitable for any skin, especially dry, rough, and lack of nutrition skin. Contains milk and natural honey essence, delicate, soft and smooth texture, easily absorbed by skin.. Applied to the hands and feet, the formation of nourishing wax layer will penetrate the absorption. Cleans the hands of horny and pore dirt. Evenly apply the Mask to hands and feet, especially joints and fingertips. Wait around 15-20 minutes for the Mask to turn into membrane, peel it off. 2-3 times a week can fade out fine lines and remove dark yellow. Continuous usage can whiten and soften skin.